I do not think we hear much of Muhammed bin Qasim at all. We only hear of the tussle between Islam and Hinduism. The character and life of the man is left uncertain. The love of Qasim and Ladi actually speaks of the rebellion of the women hood in Sindh at that time. When warriors were ordered to assassinate all women folks on the brink of Dahir’s defeat, the warrior attached to Ladi, actually hesitated, and Ladi jumped to the ground from the camel she was riding. In this way she escaped her husband’s (actual brother) wrath, and certain death. When she was saved by the army folks attached to Qasim, it was her luck again. And then Qasim bought her from those who had captured her and certainly it seemed the prophesy had come true. The prophesy was that Ladi would marry a Ruler of Sind and will give birth to another. Not that we believe in any such prophesy as being the truth. It was the love radiation between the two characters. We are told that Qasim was so much loved, that they put a life size statue of Qasim on the chowk of their main city. But we have forgotten one more thing. The product of the love of Qasim and Ladi, the son born to the living couple. They named him UMRO, and he was brought up in Sindh itself. 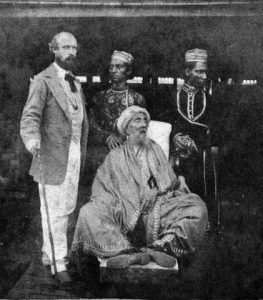 When Qasim was removed, as the new Caliph did not approve of him (different versions of his death are there), the situation in Sindh had changed after all. Historians talk of a grave of Muhammed bin Qasim in Mosul, here he was tortured at the behest of the new Caliph. 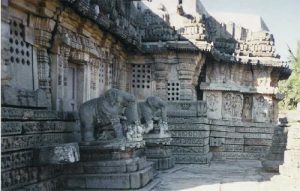 This is contrary to the story given in the Chach-nama, which is obviously the floated legend at that time. In any case UMRO was reared up in Sindh, and must have become popular with the people, as he became eventually a Governor of Sindh. We have not come across more material on him, but we will search for same, as there is evidence here, that the DNA of Qasim is still in Sindh to this day. It reminds me of a 9000 year old skeleton they discovered in a mining cave in Scotland, and after research in the nearby village (the entire’s village DNA sample was taken), they found a match to the DNA. A living person descendant of a miner 9000 years old. What fun it would be to discover a descendant of Muhammed bin Qasim in Sindh? There was another son of Muhammed bin Qasim and he was named simply as Qasim. He was Governor of Basra for 15 years, and also reached a certain kind of fame in his lifetime. So one leaves for Arabia, the other remains in Sindh. There must be more about them in some archives. 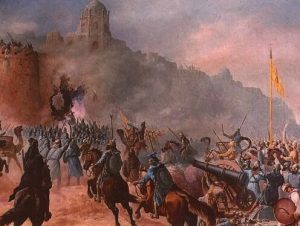 Suffice that Qasim did not conquer Sindh in the battlefield alone, he conquered the hearts of Sindh and that is why Sindh never became a Hindu nation again. Three cheers for the icon of all times! 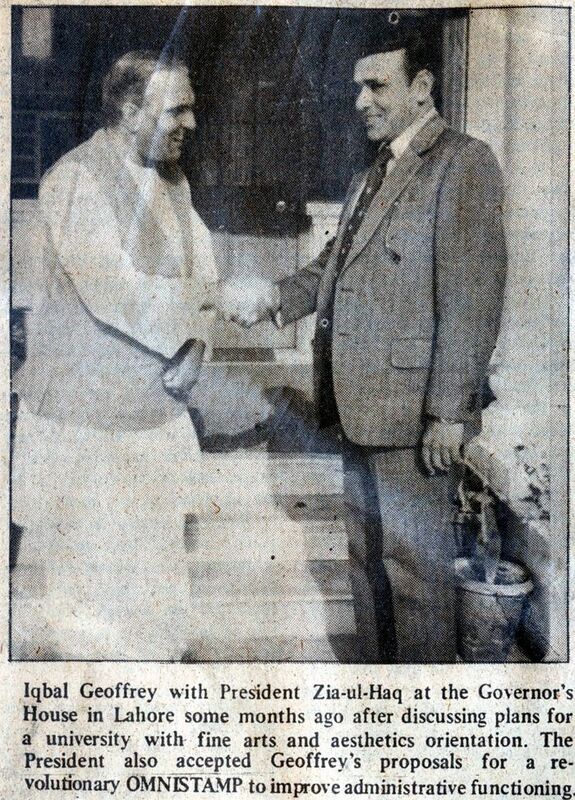 A long time back the Governments in Pakistan were Pakistani friendly and promoted our interests all over the world. Today the morons can only think of making money for themselves and their cronies. 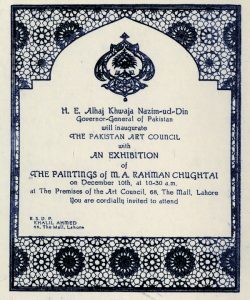 Liaquat Ali Khan presented a painting of M.A. 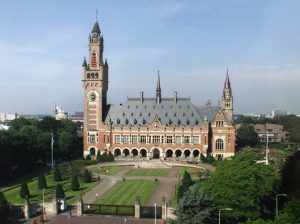 Rahman Chughtai to it at the residence of International Court of Justice at Hague, namely the Peace Palace, Hague. People from all over the world go there and are introduced to the artist from Pakistan represented there. Our relatives have enjoyed VIP treatment there by mentioning their links to the artist. We visited the place too, and received a grand reception from the Director of the place. When we picture jurists from all over the world assembled there, with Chughtai Art at their back, it sends a message of great contentment to us. There are other lobbies who are trying to sabotage such places where Pakistan is represented, and we all the bigotry of that lobby. There were various attempts to shelve the painting. Obviously by our neighbours. We do not know the latest for 2015. We will find out. In a small area inside Mochi Gate, there in Gujjar Gali, are the houses of a Chaghatai family of Kabul. Their traditional occupation was that of PAINTING and they were artists over generations. But they were known as BINDI GHARS, that is that they were reputed for making the small jewelry which is hung over the ears of the women. Their women were of exceptional beauty, famous for their dazzling eyes, which could captivate passing men with one glance. No one could resist them. Medusa was a beautiful and charming woman and many men were longing for her. Nevertheless, she was a priestess in the temple of Athena and like all priestesses so she was bound by an eternal oath of chastity. According to a Greek myth, the god Poseidon was captivated by her beauty and wanted to mate with her. He was transformed into a horse and joined with her into the sanctuary of Athena, an act of sacrilege, an abhorrent practice throughout the ancient world. The goddess enraged by the fact, could not harm Poseidon and so she unleashed her rage on Medusa. Athena transformed her into a hateful monster, which had snakes instead of hair. The ugliness was such that anyone looking at her face immediately turned to stone. In this myth, Medusa was transformed into a kind of monster called Gorgon, a horrible monster. Gorgon was symbolizing the physical embodiment of death. Since then, Medusa is the Gorgon, the mythical figure of death. If we compare our Mochi Daraza girls with Medusa, we would not be wrong, for not only did they could convert men into metaphorical stones, they also killed men.They had hold over men as nobody else could even imagine. They could make men feel like Kings or Slaves in a single stroke of womanly charm. A young man across their houses was in love with one of the girls, we call her here as just MISS M. She used to come to the roof of her house and he used to come to the roof of his house, and their glances were like magic. Miss M used to rush to her roof when the boy MR M.S, used to come back from college. The signal was a whistle they blew at each other. On her wedding day, MR M.S did whistle and she came to the roof in her bridal suit to wave at him. He still nurtures love for her after her marriage and migration to England from a long time. But here we are not talking of small talk. We are talking of a Bindi Ghar woman, who got married at least three or four times, and the result was same. She chose men of distinction with a rich family background, and then after some time, she would slowly poison her husband to death. It could have been taken as a chance, but it is suspect when it does happen again and again, as the rich widow, accumulated houses and wealth on her own. I know details of her first marriage well. She got married to my own uncle Muhammd Hussain Chughtai. I do not know how it all began, and yet I know that my uncle Muhammed Hussain (the eldest son of Mian Kareem Baksh from his first wife. 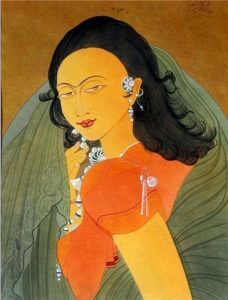 The second wife Chiragh Bibi bore the three sons, Abdur Rahman, Abdullah and Abdur Raheem) was enamoured with the idea of this Bindi Ghar girl. My grandfather took the marriage procession to that house and was rebuked by the father of MISS S. Simple reason that the procession had not come with a musical band. My grandfather went back and brought the band to satisfy that family.Obviously as my grandfather was dead by 1913, this must have happened a few years before that. My uncle was obsessed with her and she made it a habit of picking up a fight and heading for home all the time. The poor uncle of mine was really nuts for her, in times, when men could dominate women easily. He would stalk her wearing a burqa, and the people of Lahore, remembered the dreadful and embarrassing scene on the stairs of the Badshahi mosque Lahore, when she tore his burqa away. My uncle thought of ways of winning her back. She planned his death. MISS S now Mrs Muhammed Hussain came back home after being cajoled by my uncle. He did not know what he was heading towards in his own house. She slowly started feeding him poison and he became bed ridden and was unable to speak at all. When visited by my father, he looked helplessly at him, not being able to say anything at all. He died a few days later, without any children. As the Chabuk Sawaran house was divided into two portions for living; one for Muhammed Hussain, the other portion for the other family (mother and three sons) , she got hold of that whole house, family library of books and manuscripts, as well as the gold coins in the house. She sold the house in a hurry and left a legacy of the Bindi Ghar girls to be remembered for all times. Enamoured by her success, she repeated this poison thing again and again, and she completely got away with it. 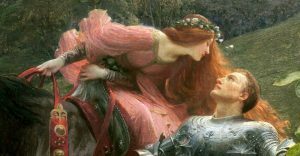 John Keats wrote: La Belle dame sans Merci, has thee in thrall. Certainly MISS S had my uncle in thrall as well as others. Such chapters of history of Lahore never recorded by anyone. We do that now! 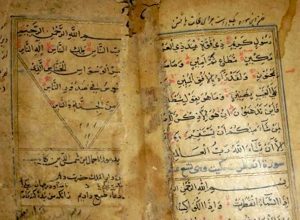 Some of the famous scribes of the initial Islamic period in this region are Mahmood Waraq, Sultan Hameeduddin Masood Ibraheem, Jamaluddin Lahori, Najeebuddin Abu Bakr Tirmizi, and many others. 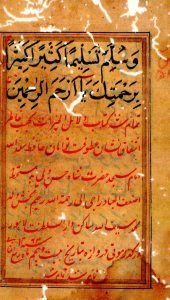 There is even a book dated 1044 AD in the Punjab University library written by Abu Hamid, a distinguished calligrapher of those times. 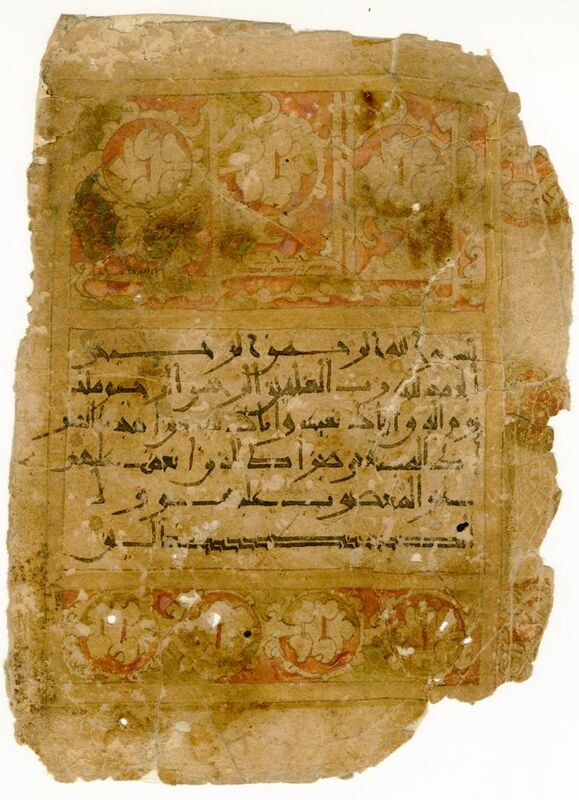 It is written that Sultan Ibraheem placed a Quran written in his own hands at the Mazar of Ali Hujveri Data Darbar, which was there till the Sikh times. 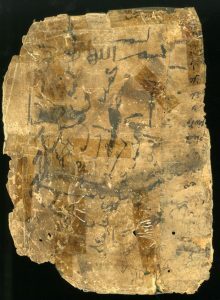 A Quranic page of Ghaznavid era is with us and it was discovered saved in an ancient Quran in the Niwin Masjid Lahore. The naqashi indeed very historical as coming from a Lahore long forgotten. It is our pleasure to share this parchment with others. The Indian region was known as MARKAZ-I- ISLAM-I- HIND after the Muslim rule, but in 1211 Sultan Iltutmish gave it a new title that of DARUL MULK HINDUSTAN and the capital Delhi as Darul Mulk Hazrat Delhi. For a long time it remained as such and we have coins of Emperor Humayoun dated around 1530, when it is still known by the same name. Darul Mulk Hazrat Delhi seems to have been adopted for use from 1211 to 1530. And within Humayoun’s own reign in the same year it became Darul khilafat Agra. 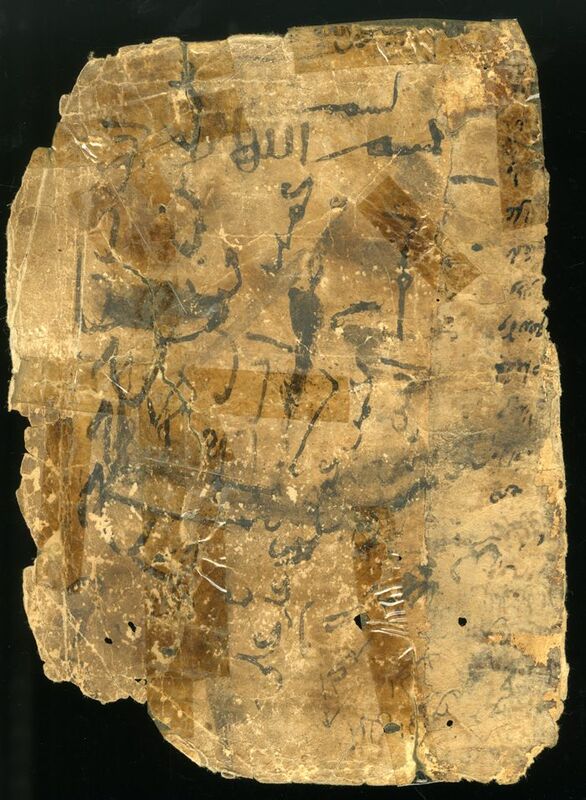 So when we discovered a small size incomplete Quran written elegantly by scribe MAULANA JAMAL SON OF SHAMAS-UDDIN KATIB, we are sure that the scribe belongs to either the Lodhis or Babar’s period of reign. It is indeed a very early Quran in the history of regional Qurans. But this Maulana Jamal may be an earlier person, and we have the identity of Ustad Jamal uddin Lahori with us too. Our archives are full of wonderful materials for the researcher and we love to share our possessions with worthy people. 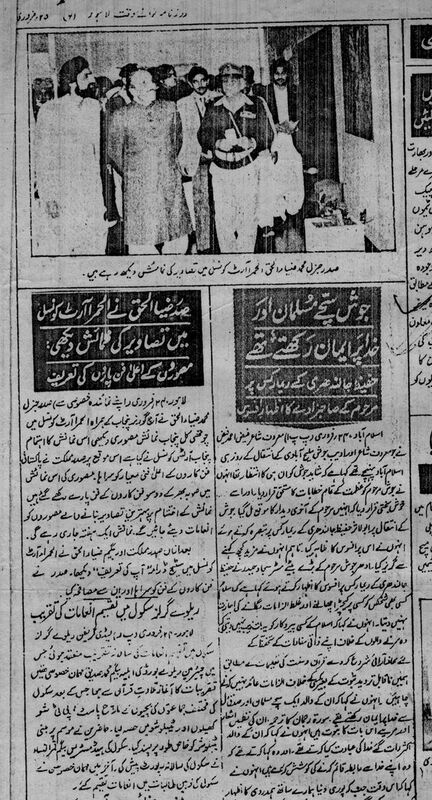 President Zia ul Haque concentrated on the Ideology of Pakistan. Those who are allergic to same vomited in their best suits. A large group of people would like Pakistan to be rudderless and most of them have no ideals, except being fed by foreign lobbies. This is no joke, it is a fact. Living in palaces themselves, they make fun of the people of Pakistan and their pursuit of egalitarianism. President Zia may have made hundreds of mistakes but it was not due to his lack of passion for Pakistan. After all he actually gave his life for his country, a genuine Shaheed, as compared to pseudo claims by other politicians. 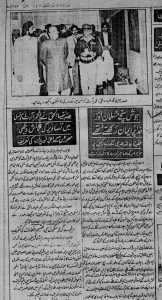 President Zia ul Haque contacted Chughtai Museum on phone many times but we could not see eye to eye. Our concepts were different. But his patriotism was without any question mark. 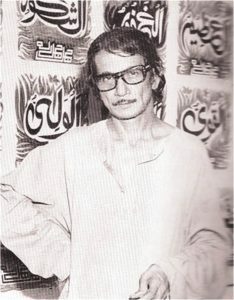 He also contacted Sadequain and the artist took many favours from President Zia. The artist even went to the house of President Zia to paint for him, on the pretext that he would serve him drinks himself. Obviously the President could not serve Sadequain the drinks he actually wanted for himself. 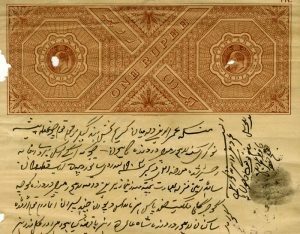 Read our other blog for more details, but the house of Sadequain was declared an interim National Art Gallery, and Fifty thousand rupees given to him monthly, through Secretary Culture, Masood Nabi Noor. Other artists also enlisted his help in their programmes and many of these things are on record. Press cuttings abound in this way. 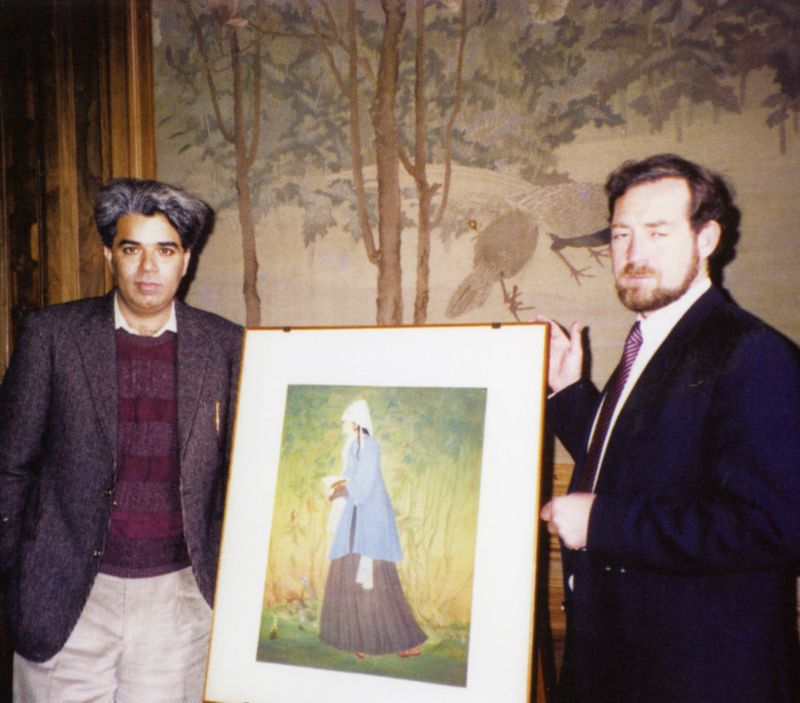 An exhibition of Pakistani paintings was arranged by President Zia ul Haque at Hirshorn Museum in USA. We were invited too but our conditions were not met, and we did not participate. We gained nothing from President Zia ul Haque, but to tell the truth is the foremost duty of those who love Pakistan. And there can be no doubt that President Zia ul Haque loved Pakistan. All military rulers were commit’ed to the Nation. Every show of M.A. 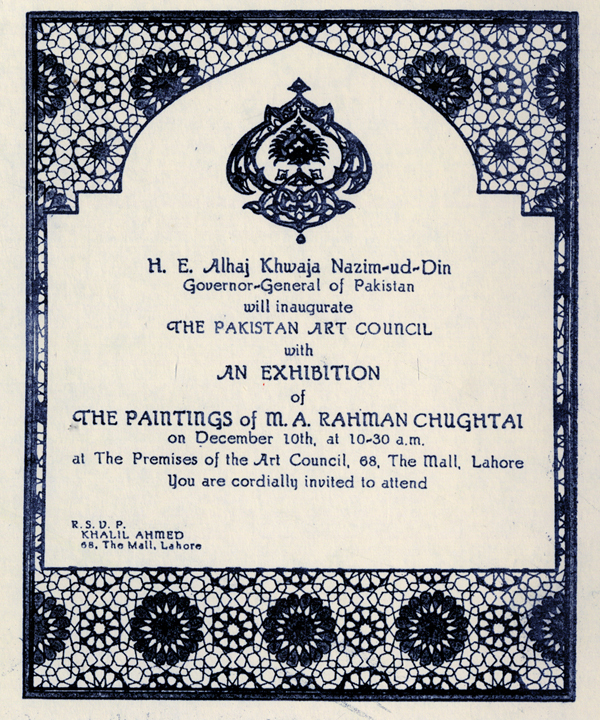 Rahman Chughtai in his life time was inaugurated at leading places by the serving Head of State. 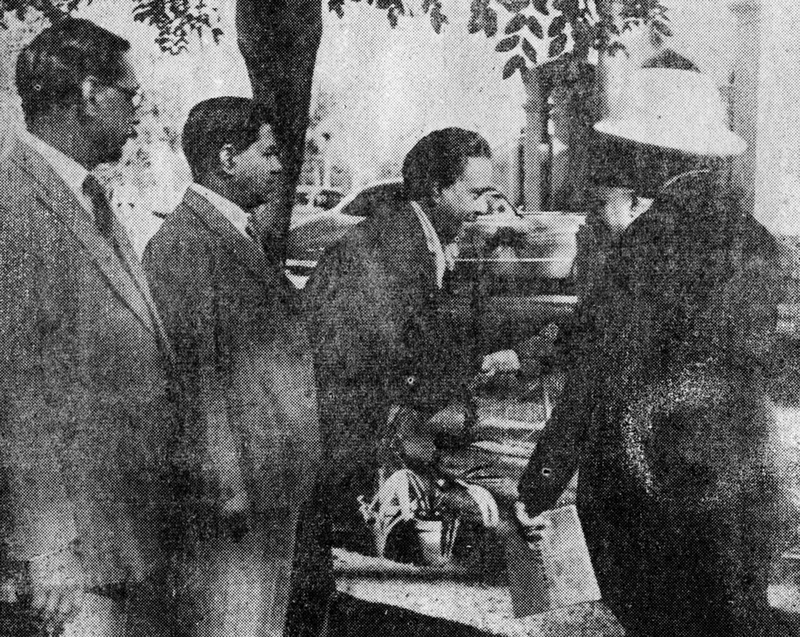 All newspapers reported those events as big happenings. Our archives are full of them. 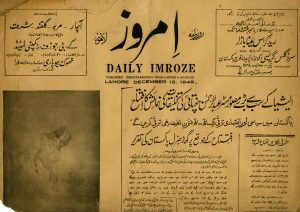 We hare a headline from Daily Imroze, the leading Urdu newspaper of its time. Culturally oriented to the extreme. And compare the narrow minded reporting that happens today. Newspapers hired their best persons to write on Art, today no best persons are even around. The tenacity of Pakistan Art to hang here without support is familiar to Pakistan itself, which has the resilience to survive the 4th and 5th generation wars launched by enemy lobbies. Professional Art writings come to our National language by Niazmandan Lahore. The love for Urdu language was phenomenal in Lahore, representing Punjabi writers who preserved and promoted the language. There was hardly anything here related to Art in our National language. M.A. Rahman ChughtaI felt the need to break this barrier. The idea of an annual magazine was formed and it was given the name of KARAVAN by M.A. 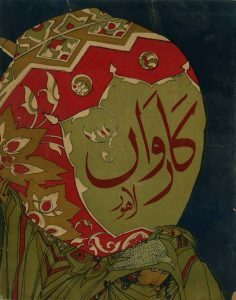 Rahman Chughtai. Not only did he design the cover of same, he collected most of the material that was to be used in the same. Most of it was in his archives. He gave the task of editing this annual to his friend Dr Muhammed Deen Taseer. The annual was a stupendous success in the art and literary world. Dr Muhammed Deen Taseer declined to do the next year annual unless he was paid a stipulated sum well in advance. (Letters in our archives). The artist was not in a financial position to so. When Taseer declined, he convinced his friend of long standing, Colonel Majeed Malik to do the same for him. The second Annual was edited by Majeed Malik Sahib, a friend whose loyalty to the artist was unquestioned under all times. Again it was much appreciated by all. The annual could have continued for a long time but there were no financial resources for same. 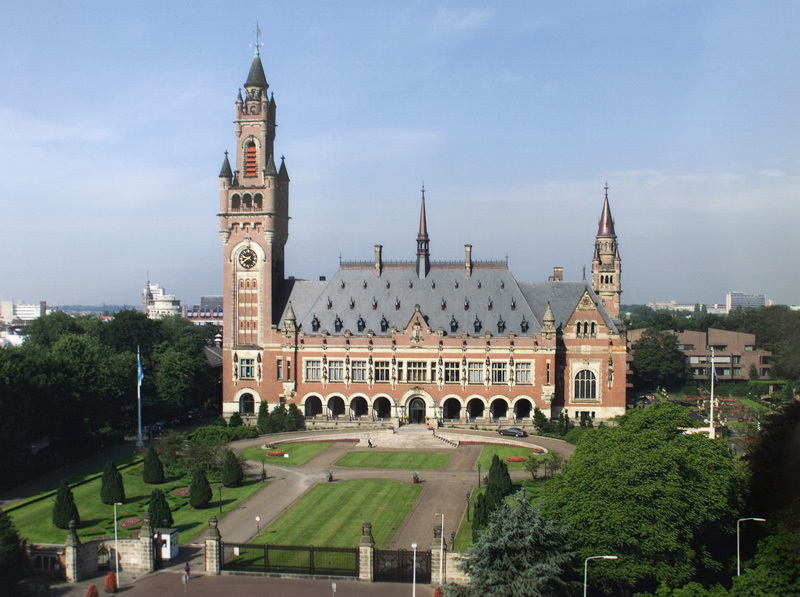 It was designed and published at a grand scale. Anything else was not conceivable. One thing the annual Karavan did was to bring Dr Allama Iqbal back into writing in the Urdu language. Dr Iqbal had shifted to Persian language and was not inclined towards Urdu in any way. 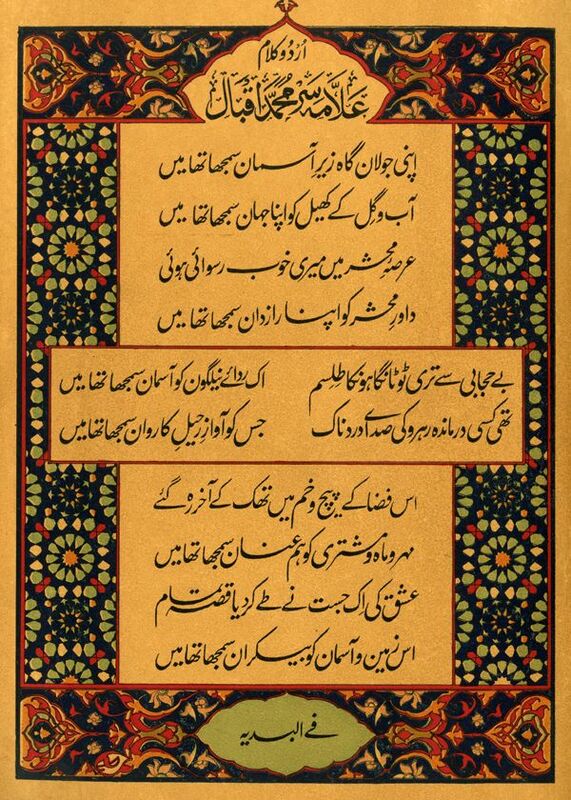 The three Chughtais and Dr Muhammed Deen Taseer convinced Dr Allama Iqbal to write a verse for them in URDU for the annual. Dr Iqbal finally succumbed to their demand and wrote some verses in Urdu. 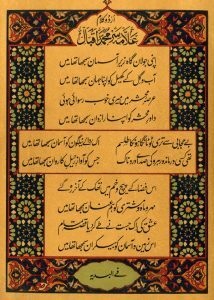 Designed by Chughtai, the verses were published in the 1933 annual, setting a new trend for Dr Iqbal’s writing. 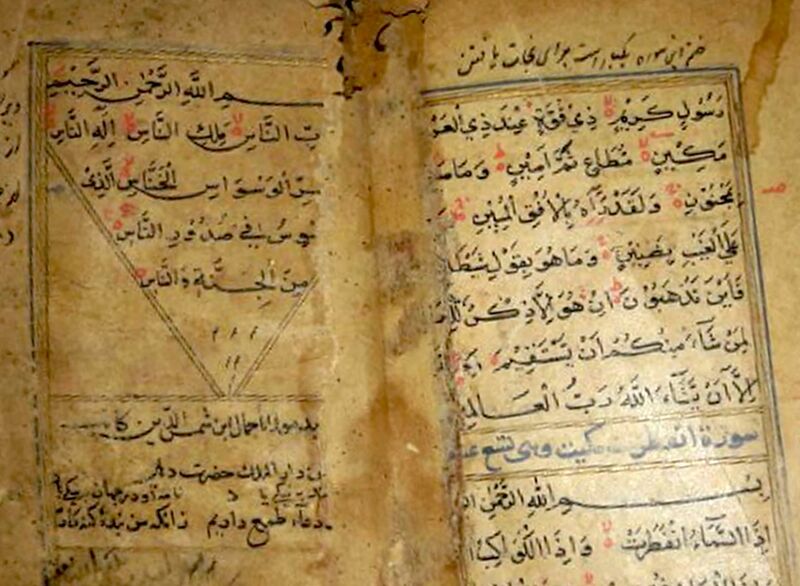 We reproduce those verses here for those who did not know about that. In short the two annuals of KARAVAN were trend setters of their times. SHARED A LOT ON THIS ACCOUNT IN MANY WAYS. M.A. Rahman Chughtai loved writing. He wrote hundreds of things and he enjoyed reading others. He loved the rebellious attitude of Ismat Chughtai. 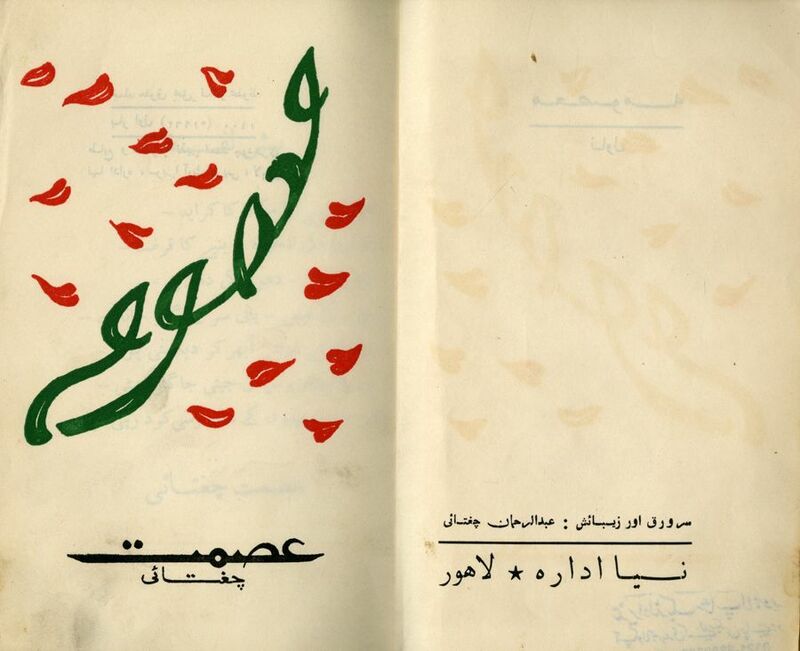 The first edition of MASOOMA in 1962 carries on its cover, a design by M.A. 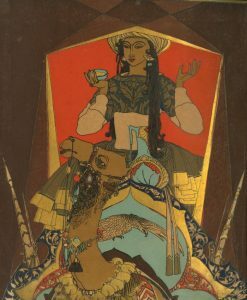 Rahman Chughtai. They were in contact with each other, and we have her letters in our archives. 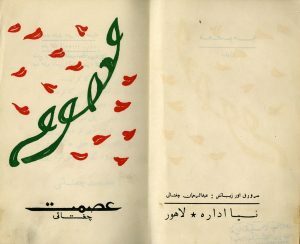 Her choice of writing CHUGHTAI with her name came from her affinity with M.A. 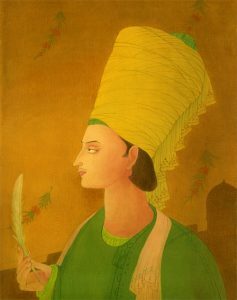 Rahman Chughtai, for other members wrote of themselves as BAIG (BEG). Very early M.A. Rahman Chughtai had presented Ismat Chughtai with a beautiful painting. It was with her till the last, till it was sold by her family, and we came to know about it. In the 1980s she visited Pakistan and was in Lahore. 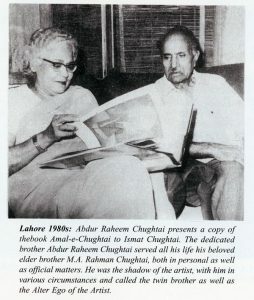 Abdur Raheem Chughtai visited her and presented her with a copy of Amal e Chughtai, the illustrated edition of Dr Allama Iqbal. She was most happy to receive same. A lot more is there and as more of our archives will be charted, more will come out of the relation of M.A. Rahman Chughtai with his literal sister Ismat Chughtai. Till then enjoy what is already there! 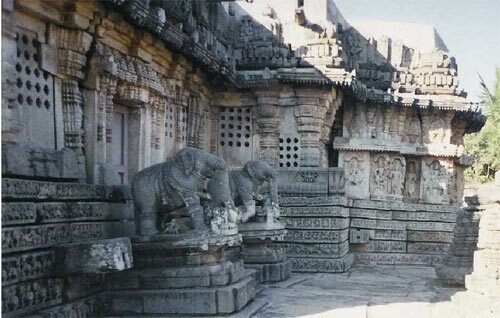 Built, demolished, renamed, lost in history. The enigma of Gates of Lahore is well known but there are many things still in dark about them. The issue is that the researchers are just empty researchers, never getting int the heart of the matter, with no access to research material, nor inclination to probe deep into matters. The war of independence of 1857 shocked the English here, as something which they had never expected from the so called rabble here. They had fed their Mir Jaffers well and knew that they would never react to anything. 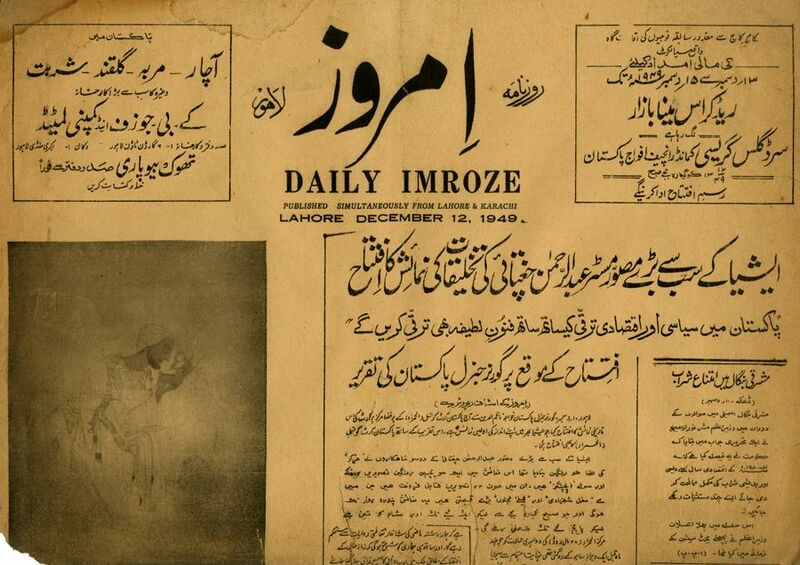 It was pure luck that a telegram reached Lahore well in time and the Army at Lahore was de-weaponized in time. But that was not enough. There was a need to make the impregnable Lahore of once upon a time, toothless in any future uprising. We have discussed the various steps taken, but there we are talking of the Wall of Lahore, the moat and the Gates of Lahore. Almost all were ruthlessly demolished, and many renamed. One missing factor is of Mochi Gate, Lahore. Researchers have pointed out that historically this name is not correct. Some have talked of the Gate being either MORCHI (army embankment with arms and ammunition place), or MOTI (named after the prostitute Moti, sister of Mai Moran, wife of Ranjit Singh). Others have even questioned the existence of a major gate near the large Akbari Darwaza (a separate narration) itself. 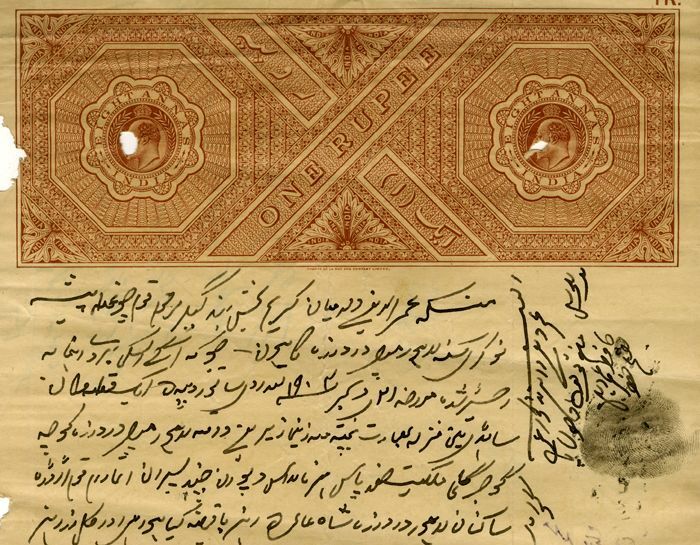 We have seen manuscripts of the 19th century, which mention the Gate as MOTI DARWAZA and we reproduce a page from a Dalail ul Khairat written by Raheem Baksh khattat at Moti Darwaza in 1846 AD, that is officially Sikh times although the British were here by that time. 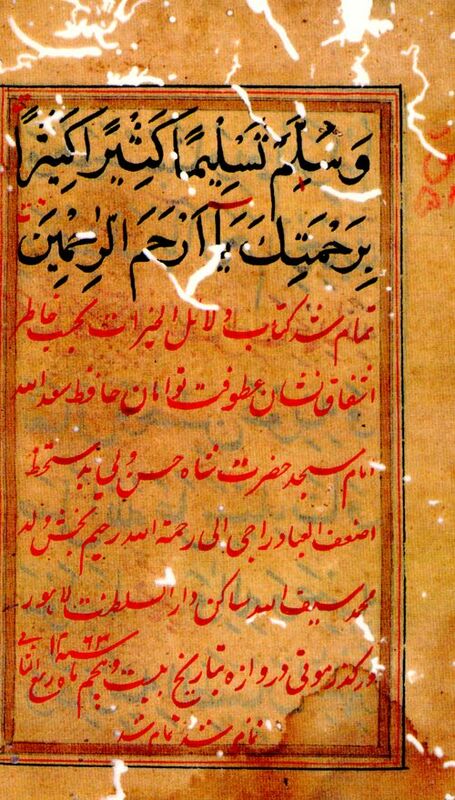 There is even an earlier Manuscript, about 1832 AD, which states the name as Moti Darwaza, and the Mohalla as Banduk saz. W. Reveley made the only known image of MOTI DARWAZA and published same in London in 1888. It looks very odd from the rest of the Gates in the city. 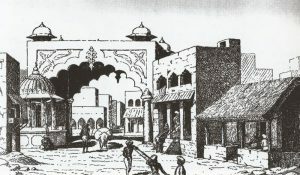 But as it goes towards the Chowk Moti nearby, it could be a construction of Sikh times, perhaps even done on a private scale by Mai Moti, a rich prostitute of Lahore. That is for research. Our job is to open new venues oi research. Why the name was changed to Moti Dartwaza? Obviously MORCHI or MORCHA was not a feasible name for the British to sponsor on into newer times. An era had ended and era of new slavery had begun. That is life anywhere and in Lahore, a land which faced onslaught all the time, nothing different. Why MOCHI? The British loved to demean the walled city. We saw that prejudice even within our life time. Mochi was to debase the dignity of the vast nobility of Lahore living inside this part of the city. I remember a friend of mine was refused admission in St Anthonys for he lived in Mochi Darwaza. He had to change his address to get into school at that time. A real thought for honourable life!